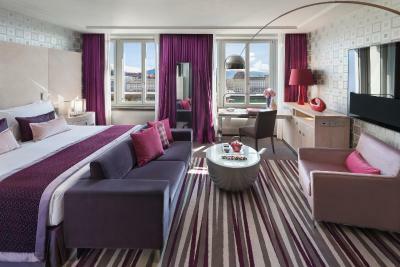 Lock in a great price for Mandarin Oriental, Geneva – rated 8.7 by recent guests! The staff were exceptional, well trained and highly professional. 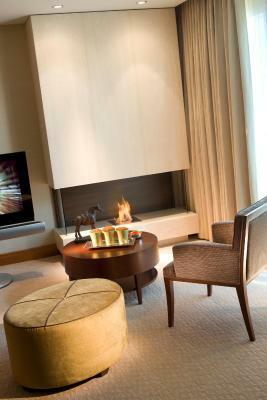 The hotel was impeccably appointed with a most spacious room an added bonus. The room service turn down service was second to none. This rates as one of the best hotels that I have ever stayed in particularly from a service perspective. We stayed two nights, from the point of arrival to our departure the staff and hotel were all excellent. 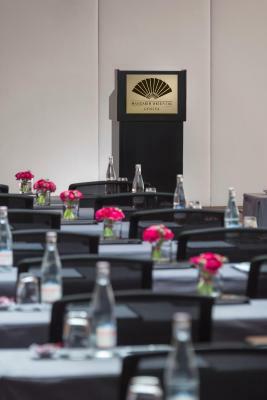 Mandarin Oriental, Geneva This rating is a reflection of how the property compares to the industry standard when it comes to price, facilities and services available. It's based on a self-evaluation by the property. Use this rating to help choose your stay! 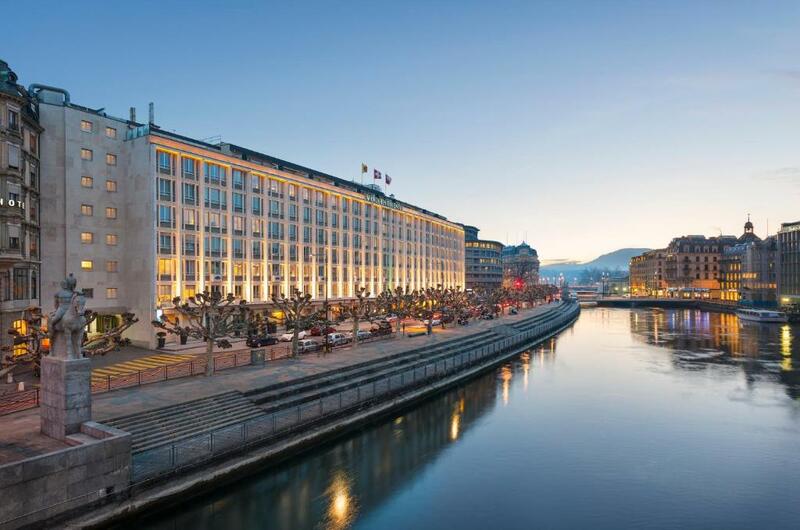 Offering 2 gourmet restaurants, the luxurious Mandarin Oriental is located on the right bank of the Rhone River, only a 5- to 10-minute walk away from Geneva’s banks, shops and galleries, and Lake Geneva. 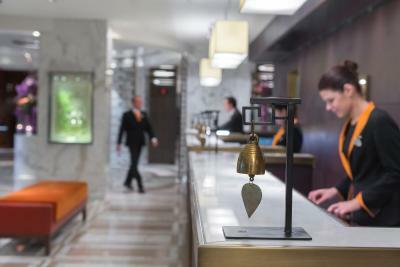 The stylish interiors preserve the building's fine Art Déco details. 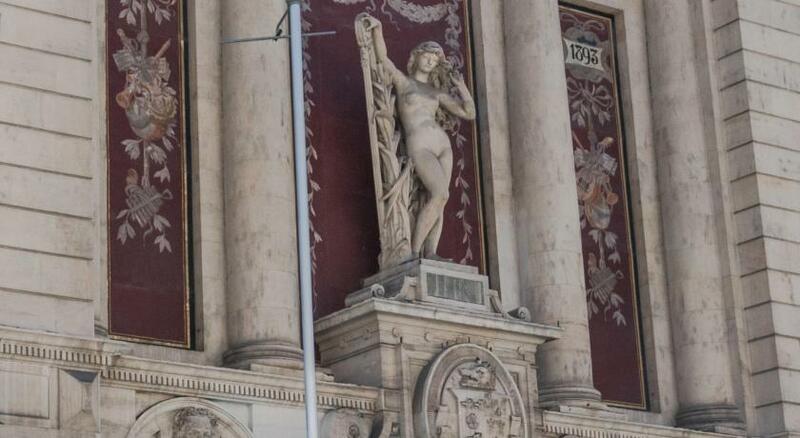 The 2 elegant restaurants were designed by famous designer Adam Tihany. The Rasoi by Vineet is the hotel’s signature fine-dining restaurant serving contemporary Indian cuisine by London-based chef Vineet Bhatia. The Yakumanka by Gastón Acurio restaurant serves Peruvian seafood delicacies such as ceviche and tiraditos. The menu also includes other specialties like freshly grilled anticuchos and pisco cocktails. 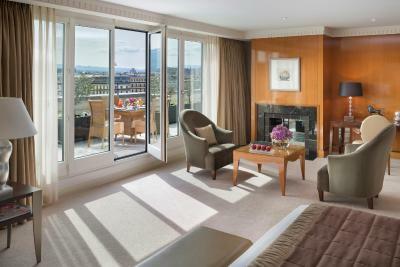 The Mandarin Oriental, Geneva also features a 24-hour fitness center and a beauty studio. 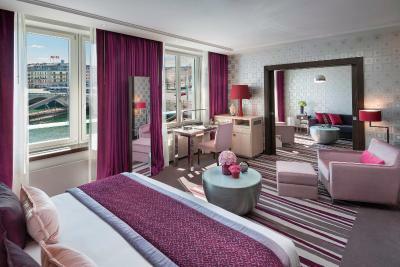 When would you like to stay at Mandarin Oriental, Geneva? Please note that extra beds/cribs are not available in this room type. 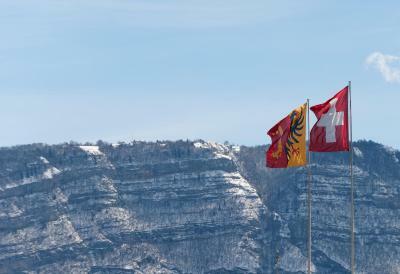 Public parking is available on site (reservation is not needed) and costs CHF 35 per day. This room offers views of the River Rhône. It is decorated in natural colors of green and brown wood, and features a large desk with a laser printer. 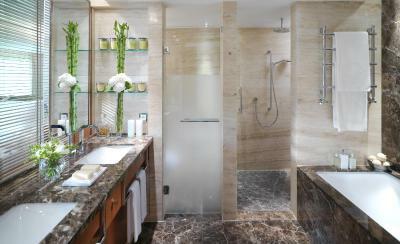 The bathroom is made of marble and features a separate shower and bathtub tub. 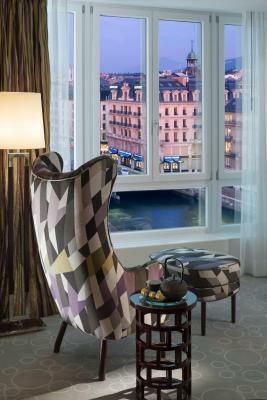 This spacious room offers a view of the River Rhône. It features a sitting area with a sofa, a large walk-in closet, a spacious desk space and a marble bathroom with a separate shower and bathtub. This Suite has views of the grounds and the city. A sliding door separates the sitting room and the bedroom furnished with a queen bed. It features a TV with a high definition digital content on demand, including the latest movies. The marble bathroom has a walk-in shower and a bathtub. This suite has air conditioning, satellite TV and electric kettle. This twin/double room has a flat-screen TV and mountain view. 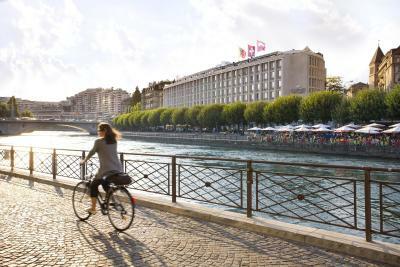 A living example of Swiss hotel tradition at its very best, Mandarin Oriental, Geneva has a superb location on the River Rhône, located within the heart of the city’s shopping, historic and business districts. Following a recent extensive refurbishment, the hotel features 189 elegant and spacious guestrooms and suites, with many suites enjoying private terraces with supreme views of the river, Old Town and snow-capped mountains. 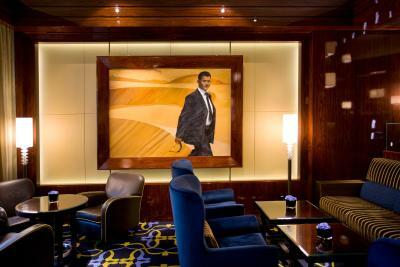 Fine-dining, unparalleled service and luxury make it the ideal choice for discerning travelers. 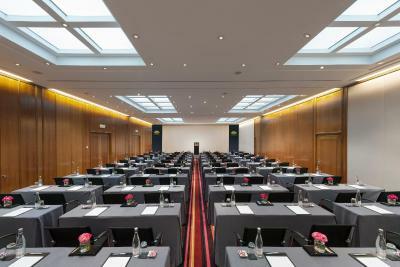 WiFi is available in all areas and costs CHF 15 per 24 hours. House Rules Mandarin Oriental, Geneva takes special requests – add in the next step! 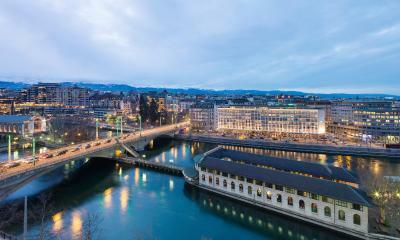 Mandarin Oriental, Geneva accepts these cards and reserves the right to temporarily hold an amount prior to arrival. If you book a nonrefundable rate, the property will send you an email with a Saferpay link for the payment. There was nothing that I could criticise. Nice and comfortable room. Very nice location. general service level. lack of clean up in rooms. The food was good along with the service. 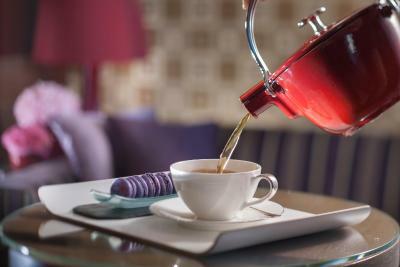 Inexperienced staffs when answering questions, gave out wrong information for breakfast price between buffet and continental breakfast and staff (a man) at cafe calla didn’t seem to help out and charged different price with impolite tone of voice. Doesn’t feel Like a 5* star hotel for this branch! Good hotel, the furniture a bit consumed.